As expected, the Yankees have called up right-hander Bryan Mitchell from Triple-A Scranton. He was scheduled to start for the RailRiders last night, so he’s good for plenty of innings behind spot starter Esmil Rogers if need be tonight. Hopefully not. Righty Matt Daley was designated for assignment to clear a roster spot for Mitchell. I’m pretty sure Daley is just going through revocable options waivers — which he’s already done on two occasions this season — and not actually being removed from the 40-man roster. He made his MLB debut more than three years ago and this is the process the team needs to go through to send him back to the minors. Whatever. As expected, the Yankees have placed David Phelps on the 15-day disabled list with elbow tendinitis, Joe Girardi told reporters. He had another MRI on Monday that confirmed the original diagnosis — tendinitis only, no ligament or other structural damage. Phelps won’t pick up a baseball for at least two weeks, so he’ll be out longer than the minimum 15 days. Right-hander Matt Daley has been recalled from Triple-A Scranton to replace Phelps on the roster on the interim. Girardi did not announce who will replace Phelps in the rotation, though he did say Michael Pineda was not stretched out enough to be a serious candidate. He didn’t rule him out completely, but it seems unlikely. Esmil Rogers, who was working as a starter in Triple-A before the Yankees claimed him off waivers last week, seems like the favorite to move into the rotation at the moment. 2:11pm: The Yankees have officially announced the trade. They get Francis and cash from the Athletics in exchange for a player to be named later. Jim Miller was designated for assignment to clear a 40-man roster spot. Francis still has to report to the team, so Matt Daley was recalled from Triple-A while they wait. 1:43pm: The Yankees have acquired left-hander Jeff Francis from the Athletics, according to Jerry Crasnick. He was designated for assignment following the Jeff Samardzija/Jason Hammel trade earlier this week. No word on what New York is sending to Oakland, but it’ll likely be a player to named later or cash. Nothing significant. Francis, 33, has a 5.89 ERA (3.67 FIP) in 18.1 innings for the Athletics and Reds this season. He had a 6.27 ERA (4.54 FIP) in 70.1 innings for the Rockies last summer. Don’t get excited by his FIP being lower than his ERA — Francis has underperformed his peripherals by at least 0.72 runs every year since 2009. He’s Vidal Nuno with less fastball. It’s probably not worth digging any deeper than that. 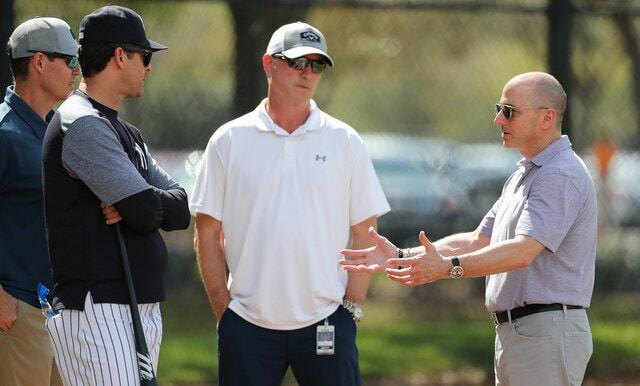 The Yankees simply need a warm body for the pitching staff at this point. Masahiro Tanaka went on the disabled list earlier this week and even with the Brandon McCarthy pickup, the team still has Shane Greene in the rotation and a TBA listed as Sunday’s starter. Francis can help get them through the weekend in one piece. Times are tough, man.